In older cancer patients, treatment decision-making is often complex. A comprehensive geriatric assessment (CGA) is an established tool used in geriatric medicine to identify unmet need requiring intervention. This study aimed to assess whether using a CGA in older male cancer patients with incurable but manageable disease provides information that would alter a cancer clinician’s intended management plan. Acceptability and feasibility were secondary aims. Elderly men with incurable but manageable malignancies (advanced prostate cancer and multiple myeloma) who had previously received at least one line of treatment were recruited from hospital outpatient clinics. A CGA was undertaken. Additional parameters measuring pain, fatigue and disease-specific concerns were also recorded, at the recommendation of patient involvement groups. Results were made available to clinicians. Patient and clinician acceptability and changes in subsequent management were recorded. Forty-eight patients completed the study. The median ages were 70.8 years and 74 years for myeloma and prostate respectively. Most identified concerns are related to disease-specific concerns (93%), pain (91%), frailty (57%) and nutrition (52%). Results altered the clinician’s oncological management plan in nine cases only. Patients found the format and content of CGA acceptable. 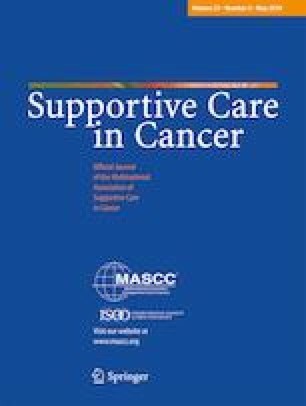 Many unmet needs were identified in this population of elderly men with manageable but non curable cancer which led to supportive care referrals and interventions. The CGA, however, did not result in significant changes in clinical oncology treatment plans for the majority of patients. The application of the CGA and other assessments was viewed positively by participants and can feasibly be undertaken in the outpatient oncology setting. We wish to acknowledge the following people who recruited patients to the study and completed clinician evaluation forms: Dr. Andy Chantry (Consultant Haematologist, Sheffield Teaching Hospitals Foundation Trust); Dr. Yousef Ezaydi (Associate specialist, Sheffield Teaching Hospitals Foundation Trust) and Dr. Catherine Ferguson (Consultant Clinical Oncologist, Sheffield Teaching Hospitals Foundation Trust). We also wish to acknowledge Dr. Jane Fearnside (Research Fellow, School of Health and Related Research, University of Sheffield) for the early protocol development; Andrea Foster (Clinical Nurse Specialist, Haematology, Sheffield Teaching Hospitals Foundation Trust) for the clinical support and potential participant selection; Rachael Selby (Senior Research Sister, Haematology, University of Sheffield) for the logistical support, clinical advice and potential participant selection; and the research staff at the Cancer Clinical Trials Centre, Academic Unit of Clinical Oncology, University of Sheffield, in particular Dr. Janet Horsman for the support in database development. We particularly thank all the patients who took part in this study. This study was funded by a research award from the Sheffield Hospitals Charity. Dr. Catherine Handforth has received funding from Weston Park Hospital Cancer Charity, and Prof John Snowden has received funding from the Sheffield Hospitals Charity.